Many thanks to the Verizon Foundation, who awarded a grant to the Clatskanie Chess Club to bring "Digital Chess" to our students. We purchased small laptop computers (that are easily transported to schools, tournaments and our club). We also purchased software and equipment to bring coaches/instructors from around the world to our students! Here's how it works.... Coaches connect to our players via Skype videoconferencing. 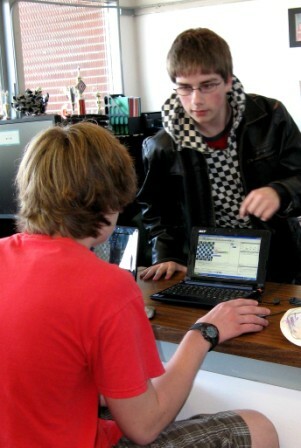 Games are analyzed using Babbas Chess on www.freechess.org Instruction and advice take place one-on-one or in a group setting through digital projection on the laptops. Our students also have access to players from around the world. It doesn't matter if they speak the same language or not. Chess is universally understood! We also use the latest chess training software from Chessmaster, Convekta and Fritz. Even though we are a very small, rural community in the Pacific Northwest... we have access to the best training the world has to offer. We appreciate the opportunity that the Verizon Foundation has afforded our club members. And we have the gold to prove it! Our students have received local, national and international acclaim! Local sponsors: The Clatskanie Together Coalition and Clatskanie Kiwanis, help pay for the coaching time received online to keep our program going from year-to-year.